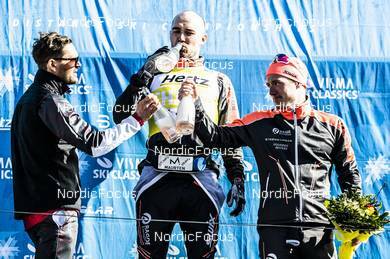 13.04.2019, Levi, Finland (FIN): Oystein Pettersen (NOR), Andreas Nygaard (NOR), Oyvind Moen Fjeld (NOR), (l-r) - Visma Ski Classics Yllaes-Levi, Levi (FIN). www.nordicfocus.com. © Christian Manzoni/NordicFocus. Every downloaded picture is fee-liable.